If you’re unfamiliar with Quentin Tarantino movies, then you’ve been missing out on one of the most dynamic filmmakers to come along in the last 20 years. Sure, his manic behavior, large forehead, and all-around geekiness set him apart from more reserved (ie “normal”) contemporaries like Robert Rodriguez, but he makes up for it by presenting a unique vision drawing from such diverse genres as samurai films, blaxploitation films, crime flicks, and revenge movies. Expect all his motion pictures to be ultra-violent, filled with dark humor, and presenting events in a non-linear fashion. In addition to his directorial efforts, Tarantino has enjoyed great success as a screenwriter and producer. His Pulp Fiction screenplay won him an Oscar (along with Roger Avary), and he’s written films that other people would later direct (True Romance, Natural Born Killers). He’s helped shine a spotlight on international cinema, being a driving force behind the U.S. success of films such as Iron Monkey, Chungking Express, and Hero. And he also served as producer for Larry Bishop’s Hell Ride…but nobody’s perfect. My Best Friend’s Birthday (1987) – In this black-and-white amateur film, Tarantino served as writer, producer, director, editor, and star. Made while he was still working at a video store in California (along with Pulp Fiction co-writer Roger Avary), it tells the simple, 70-minute story of a person’s efforts to do something nice for their best pal’s birthday. 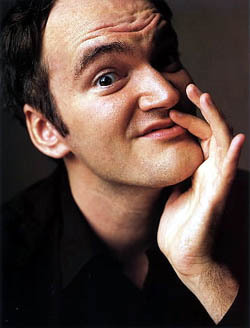 While much of the film has since been destroyed in a fire, Tarantino has often referred to it as his film school. It’s also notable for its comedic tone, definitely the most lighthearted project that Tarantino has directed to this point. Shot over a four year period with a budget of $5000, it’s worth a look if you can catch it at a film festival. Reservoir Dogs (1992) – While it only played in limited release at theatres, this Quentin Tarantino movie really took off when it hit the home video market. Boasting a cast filled with veteran actors (Harvey Keitel, Chris Penn, Tim Roth) and future stars (Steve Buscemi, Michael Madsen), Reservoir Dogs tells the story of a robbery gone horribly wrong. As the surviving thieves rendezvous at a warehouse, they come to the slow realization that one of their number is an undercover cop. Filled with ‘70s rock, torture scenes, pop culture references, and an abundance of macho-driven dialogue, it reinvented the crime genre and inspired a whole generation of up-and-coming filmmakers. I still remember reading about it in Film Threat magazine, but being unable to see it when it came to the nearest arthouse theatre. As soon as it hit VHS, I picked it up and was blown away. All these years later, me and a buddy still quote it from time to time. Pulp Fiction (1994) – The undisputed champion of Quentin Tarantino movies, Pulp Fiction is a gritty and uproarious look at the crime scene in L.A. that follows a number of intersecting characters. Presented as a series of out-of -sequence tales, it successfully restarted the career of John Travolta, made Samuel L. Jackson a household name, and introduced the moviegoing public to Ving Rhames. 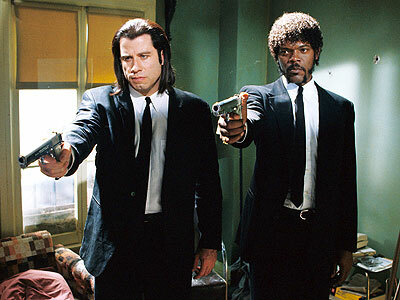 The three major storylines include: “Vincent Vega and Marsellus Wallace’s Wife,” in which a drug-addled hitman (Travolta) is asked to take a crime lord’s wife (Uma Thurman) out for a night on the town; “The Gold Watch,” in which an aging boxer (Bruce Willis) looks to screw over the mob and disappear, only to run into some unexpected trouble; and “The Bonnie Situation,” in which a pair of mob hitmen (Travolta and Jackson) must dispose of a corpse with the help of a high-class fixer (Harvey Keitel). Other supporting cast members include Tim Roth, Amanda Plummer, Eric Stoltz, Christopher Walken, and Rosanna Arquette. Four Rooms (1995) – Set in an L.A. hotel during New Year’s Eve, this darkly comical anthology features segments directed by Tarantino, Robert Rodriguez, Allison Anders, and Alexandre Rockwell. Tim Roth plays Ted the Bellhop, a new employee who serves as a linking device between the four segments. Tarantino’s offering, “The Man from Hollywood,” stars the director as Chester Rush, a famous filmmaker who’s made a bet with one of his pals (Paul Calderon): if the man can light his Zippo ten times in a row, then he’ll win Chester’s car. If he fails, he loses a finger. Poor Ted gets bribed into being the impartial “hatchet man,” and the tension builds as an uncredited Bruce Willis and a prostitute look on. An entertaining update of an episode of Alfred Hitchcock Presents, which starred a young Steve McQueen alongside Peter Lorre. Jackie Brown (1997) – Tarantino pays tribute to blaxploitation movies with his film about Jackie Brown, a middle-aged stewardess (Pam Grier) mixed up with a murderous gun runner (Samuel L. Jackson). When she’s nabbed by the authorities (including Michael Keaton), she must concoct a scheme to stay out of prison and make a few bucks in the process. Luckily, she’ll have the help of Max Cherry (Robert Forster), a bail bondsman who quickly falls for her. Featuring critically lauded performances from Forster and Grier, as well as a soulful soundtrack that includes everyone from The Meters to Bobby Womack, Jackie Brown is a well-written crime film that goes down as smooth as Coffy. Co-starring Robert De Niro, Bridget Fonda, Chris Tucker, and Sid Haig. Kill Bill, Vol. 1 (2003) – Shot as one film and released in two parts, Kill Bill is Tarantino’s epic tribute to both revenge films and samurai movies. Uma Thurman stars as The Bride, a retired assassin who’s gunned down on her wedding day by former lover/mentor, Bill (David Carradine), as well as her one-time co-workers (Lucy Liu, Michael Madsen, Daryl Hannah, and Vivica A. Fox). Waking from a coma four years later and finding herself no longer pregnant, she revolves to hunt down and kill those responsible for her child’s death. So she draws up a list, gets a legendary Japanese swordsmith (Sonny Chiba) to make her a weapon, and then sets about slicing and dicing the bad guys. The highlight of the film comes during the “House of Blue Leaves” segment, when our plucky heroine invades a Japanese restaurant and sparks a massive and bloody swordfight with the gang known as the Crazy 88. Kill Bill, Vol. 2 (2004) – The Bride (Uma Thurman) continues her quest for vengeance, this time setting her sights on Elle Driver (Daryl Hannah), Bud (Michael Madsen), and his brother, Bill (David Carradine). While the action isn’t quite as furious as the first film, there’s still a badass movie catfight between Thurman and Hannah, not to mention entertaining flashbacks to The Bride’s days of study under strict Chinese martial arts master Pai Mei (Gordon Liu from The 36th Chamber of Shaolin). Tarantino has claimed in interviews that he intends to do a third Kill Bill film in 2014, which will focus on Thurman’s character being hunted by the daughter of one of her victims. Death Proof (2007) – Originally intended as a slasher film, Tarantino’s half of the commercially disastrous Grindhouse evolved into a revenge tale about three tough chicks (Zoe Bell, Rosario Dawson, and Tracie Thoms) who turn the tables on a homicidal stuntman (Kurt Russell) with a “death proof” car and a thing for vehicular manslaughter. Recommended for fans of old school car chases and lengthy scenes of women talking. While the latter quickly becomes tiresome, the former somewhat makes up for it (although I preferred Planet Terror, Robert Rodriguez’s half of Grindhouse). Inglourious Basterds (2009) – While a longtime fan of the genre, this was Tarantino’s first foray into war movies. The resulting effort was both a critical and commercial success, although it didn’t hurt that it also boasted the starpower of Brad Pitt. As with many Tarantino films, multiple storylines are developed and eventually converge. In the first, a young Jewish woman (Melanie Laurent) escapes the slaughter of her family at the hands of a calculating SS officer (Oscar winner Christoph Waltz) and begins life anew as a theatre owner in Nazi-occupied France. In the second, a group of ruthless American soldiers are dropped behind enemy lines in an effort to create fear and panic among their enemies. When both sets of characters learn that Hitler will be attending a movie premiere at the aforementioned theatres, multiple plans are put into motion to take out the upper echelon of the Third Reich. A satisfying bit of revisionist history that co-stars Eli Roth, Michael Fassbender, Diane Kruger, and Til Schweiger, Inglourious Basterds garnered both Best Picture and Best Director nominations. So there you have it: all the Quentin Tarantino movies released to this point. There’s little doubt that the man is an exceptional talent, and his ability at taking material from other films and appropriating it into his own is without equal. If you’re only just now discovering his genius, I suggest an online rental service as a great way to catch up, as they’ll deliver all the films listed above right to your doorstep (well, with the exception of My Best Friend‘s Wedding). We do get a commission when you join Netflix, but that money goes right back into the site. This entry was posted on Thursday, February 10th, 2011 at 12:21 pm and is filed under Good Movies. You can follow any responses to this entry through the RSS 2.0 feed. You can leave a response, or trackback from your own site.